A fully remodeled bathroom is one of the most desired of all home remodeling projects and is also one that can do the most to add real estate value to your home. By some estimates, a new bathroom can pay for itself by adding real estate value that is at least equal to the cost of remodeling. A luxury bathroom can cause potential buyers to enter bidding wars for home, while the same residence with a tired, old bathroom might languish on the market without so much as a single bid. Bathroom remodels are also one of the hardest of all remodeling projects for which to estimate costs, since there are so many variables at work and because the materials are available in such a wide range of quality. When you can spend as little as $100 on a new toilet or as much as $10,000, is it any wonder that remodeling costs can vary enormously? In a 2018 survey by HomeAdvisers, a digital marketplace that allows homeowners to explore home improvement costs and contact prescreened professionals, the average bathroom remodel in 2018 cost $10,246, with most falling between $5,943 and $14,771. Updating all essential fixtures and surfaces for a small or medium-sized bathroom ranges from $3,500 to $7,000, while large master baths can go well beyond $13,000 or more. It should be noted, however, that these figures are averages of a large sample that includes both DIY and contractor installations. Skilled homeowners willing to budget shop can often beat these costs by doing the work themselves, while contractor jobs can go much, much higher, especially when a bathroom is being demolished to the studs and structurally expanded. A survey by NKBA showed that half of homeowners paid between $10,000 and $29,999 for a bathroom remodel, while 31 percent reported paying more than $30,000. A helpful way to look at bathroom remodeling costs is by categorizing different levels of work that are involved. Typically, when a project is of the facelift variety, it is done to save money, and the materials used tend to be chosen for economy. But homeowners who are pulling out the stops to hire a general contractor are usually willing to spend large sums, choosing more premium fixtures and materials. This means that a "remodeled" bathroom can cost around $1,000 for a DIY homeowner who is replacing surface materials and perhaps a fixture or two, or as much as $50,000 or more for a bathroom that is gutted and expanded, and filled with top-end materials and fixtures. 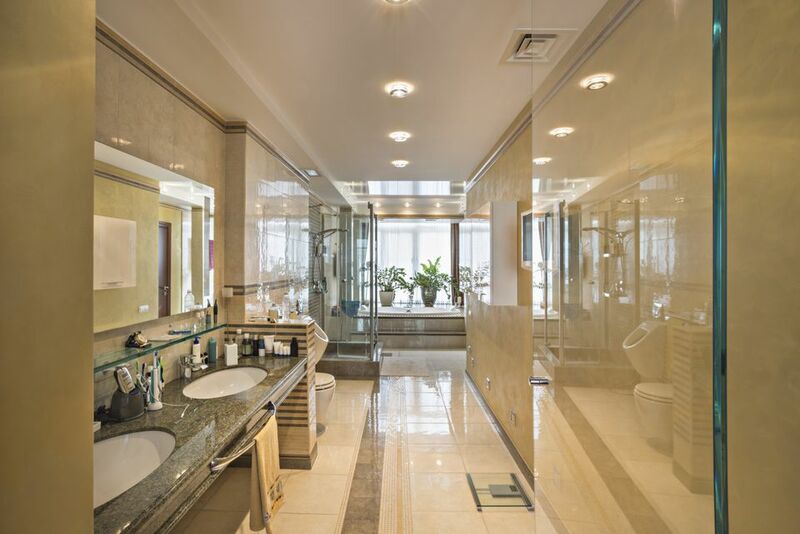 And if you think it's an exaggeration to think that people every spend $100,000 on a new bathroom, you'd be quite wrong—there are more of these bathrooms around than you imagine. The range of prices here depend on the quality of materials selected: Are you bargain shopping at the big-box home improvement centers, or buying from designer stores? Replacing old vanity and sink with new special-order vanity with quartz or granite countertop with an integrated sink. Homeowners should carefully consider their skill level and the time required for such a project. A structural expansion can take a lot of time, so make sure you have at least one other bathroom in your home you can use for the duration of your project. More than one homeowner has spent a full year completing a bathroom remodel of this scale. Like the DIY version, this type of project entails replacing all surfaces and fixtures in a bathroom, but in this instance, the work is done by one or more professional contractors you hire. At this level, an owner/builder contractor is a good choice. An owner/builder construction contractor is an experienced carpenter who likely does much of the hands-on work himself, but also subcontract other professionals for the tasks for which he is not qualified. For example, the owner/builder contractor may hire a licensed plumber to do any plumbing work necessary, while doing all the rest of the work himself. He may also staff a small group of additional carpenters who work alongside him. A typical bathroom remodel on this scale will include all of the features described in the DIY Complete Makeover (above), possibly using more premium materials and fixtures. At this level, the new bathroom is an actual room expansion—it becomes a very major project that is virtually an all new bathroom. It entails gutting the bathroom down to the studs, tearing out walls, and reframing new walls to create a larger bathroom space. There may be full-blown rerouting of all plumbing lines and installation of new electrical circuits. Very few, if any, of the old bathroom fixtures, are retained. In rare instances, this kind of project might actually entail a structural bump-out or small room addition that changes the overall footprint of the house itself, including new foundation work. This is the type of project is usually left to the hands of a GC (general contractor) who does little, of any of the work himself. Instead, a variety of subcontractors—carpenters, plumbers, electricians, tile setters, and painters—will come in an out of your house to do the work. When a project reaches this level, the upper-cost limit can get quite high indeed, as luxury bathrooms costing $100,000 are not rare.